If you are looking for a compact grill to use on-the-go, be sure to check out Char-Broil's Portable Grill2Go X200 Gas Grill. This small grill is perfect for camping trips, picnics, tailgating, and any other setting where you'd find it beneficial to use a small gas grill with minimal fuss. This great tabletop grill provides the ultimate in no-fuss outdoor cooking away from home. It's the ideal size for carrying along on various types of trips and excursions. It's also a good choice for at-home cooking if your household size is small. For example, it's a great size to prepare meals for singles or couples. If you live in an apartment or condo, or a house with a small yard and don't need to prepare huge quantities of food when you grill, this just might be your perfect everyday grill. Cooking with this grill is super-easy. It has a built-in Piezo electric igniter that allows for push-button ignition. So, you can easily get your grill going without needing matches or a lighter. The electronic igniter isn't this grill's only great feature. It also has a built-in temperature gauge on the top, which is very helpful. Additionally, it is made with the TRU-Infrared cooking technology, which is designed to prevent flare-ups. You're sure to enjoy using it for all your favorite grilling recipes. It is also a durable and sturdy grill, which is what you would expect from Char-Broil. The body is constructed from die cast aluminum and the burner and grade are made from stainless steel. You can expect it to hold up through many trips and uses. Priced just under $150, this grill offers Char-Broil quality in a compact size at an affordable price point. 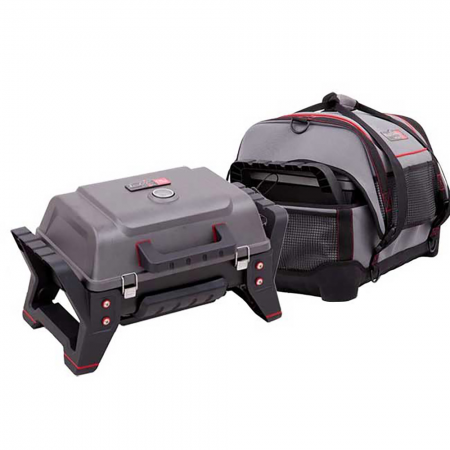 Transporting this grill is also very easy, especially if you invest around $60 in the Grill2Go® X200 Carrying Case. This case is especially designed to be used with this model. It is definitely worth the price, especially if you plan to travel with your grill. It holds the grill very snugly and has handles that Velcro together at the top for easy carrying. This is the simplest compact gas grill you will ever use. You don't even have to assemble it! 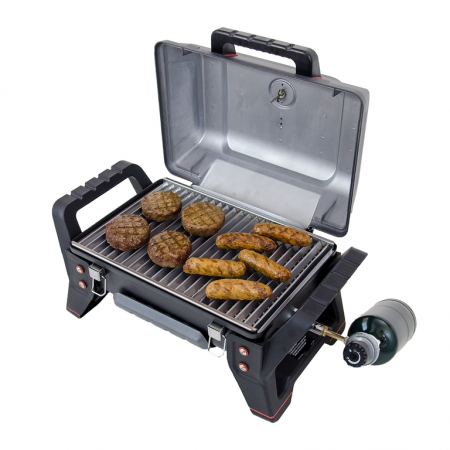 This grill comes already put-together, so you can take it out of the box and put it to use as soon as you purchase it. You could pick one up from the store on your way to the stadium or campground and use it as soon as you arrive! What could be more convenient? Note: The author received a sample of this grill for review purposes. The opinions shared here are her own.